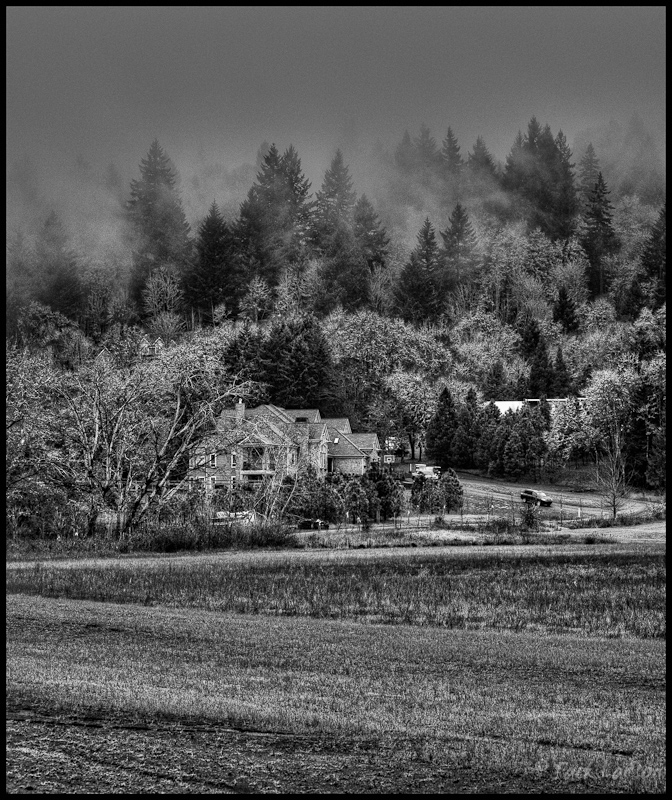 john4jack (Corvallis, Oregon, United States) on 6 March 2010 in Landscape & Rural and Portfolio. This is a B&W conversion of yesterday's HDR version. I used Silver Efex. Love this much Jack!! Well done! I'm a fan of the last one, color HDR. I love the different processing you have done on the one view. Great work. Good morning master Jack! Good morning in B / W! Lovely image! It has a special charm and completely changes the percepció of who is watching! @Fonts: Your kisses will make it a great weekend. :) I also love this one too!! i will choose 2 for the price of 1.. :) !! Wow, one of my fav at your place, the quality of this monochrome is unique ! Oh my! I love it in B&W! I like the mood. I do not know the one that I prefer... A very beautiful b&w ! im not usually a fan of HDR but this is great. @Thomas White: My favorite use of HDR is for B&W conversions. Very beautiful image is sublime! My preference goes to the first version, because of the colors and the fact that the fog plays more of a role. Très belle image... mais je préfère nettement celle en couleur. Oooooh! This one is wonderful too! each one is so distinct- I love all of them. Awesome shot! Love the effect! Of course it's very powerful in mono but however is still prefer the color version. Very beautiful. I'm getting a new appreciation for HDR. @Steve Rice: I prefer HDR much more for B&W conversions than for color. When it comes to color, I rarely use it except to deal with a range of light that exceeds the capture capacity of my camera. Wonderful processing , almost hard to believe it is HDR ! Love it much , much more than color versions ! @MARIANA: Generally the only color HDR photographs that I like are the ones where you can't tell that it's HDR. However, I respect the right of each photographer to do what pleases him or her. When I comment on HDR photographs, I do it relative to the photographer's goals. The conversion worked beautifully......i'd like to see it, using the crop from yesterday....could that be tomorrow's version????? @Susan: This is my favorite use of HDR. Tomorrow's shot is a wide angle shot taken with my D700 and 24-70mm lens. Like this Hdr B&W version. Contrasts are excellent, almost like we put an orange or red filter (if my memory is good... ) when we used argentic. I don't usually like HDR but it works here. It gives the b+w an ice slightly bizarre look. My first thoughts were bw with this. I love how the details of the trees come through, nicely processed! Wonderful Treatment for a dramatic mood...........5 stars,Sir !!! This gives it much more atmosphere - how interesting it is to compare these shots. What did I say, Jack..... for me, this will be the one. Mono rocks here and the tonal variances are stunning. "Okay," she says reluctantly, "I may not like HDR, but I think this shot REALLY works. @Dulcie: That's because it is a conversion to B&W. For me, by and large, the only HDR color photographs that work are the ones where you can't tell that it is HDR. And that can be done. Moreover, some of the new software such as HDR PhotoStudio 2 creates a more realistic look than does Photomatix. Plus, if you know what you are doing, you can create a realistic look with Photomatix. A fine image made more unusual and appealing by your special processing. Fine job of preparing an eye-catching image. I really like the B&W version, Jack. Very mysterious. Nice work. This is great in black and white also! The HDR looks a bit to heavy for me. I do not do HDR but enjoy it if you can not tell it has been done. Nice work. It makes it look colder. This is my favorite! difficult choice between 3 and 4. A tighter crop and I think I just like Silver Efex images anyway.